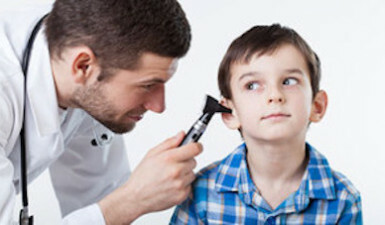 Some children may occasionally develop a ringing, hissing or buzzing sound within their ear. In most cases this sound will only last for a few moments. However, when the sound in their ear does not improve or go away, this should be a cause for investigation. A ringing sound in the ear that doesn’t go away is called tinnitus. The sound that your child hears may be timed with their heartbeat or breathing, and while it sometimes appears constantly, in other cases it is off and on. Tinnitus is most common in people over the age of forty, but in rarer cases may appear in young children as well. Tinnitus comes in two forms, and this is pulsatile tinnitus and nonpulsatile tinnitus. Pulsatile tinnitus is caused when sounds are generated through the movement of muscles close to ear, as well as changes in blood flow or the ear canal. Nonpulsatile tinnitus is a result of problems which occur with the nerves that are associated with hearing. The child may detect sounds in one ear or both. Both types of tinnitus are a result of hearing loss, and in children it will typically be caused as a result of acoustic trauma (unusually loud noises close to the ear). Dr. Samadi will ask the parents of the child about any symptoms they are experiencing, as well as conducting a physical examination and reviewing the child’s medical records. In addition to the ears, he will also examine their head, neck or torso, as this may provide clues as to the cause of the condition. When examining the ears he will use a special device called the auriscope, which allows both the internal and middle ear to be examined. Your child may also need to take a CT scan or MRI, as well as a blood test. Because tinnitus can sometimes be caused by dental problems, if this is the case you will be referred to a dentist. There are no medications available which are specifically designed for tinnitus treatment. The treatment provided at ENT for Children will depend on the underlying cause of the condition. This is why it is important to determine what this is. In most cases, tinnitus will improve over time, in a process which is called habituation. This means that the child’s brain will adapt to the condition in a way that does not allow it to negatively impact his or her life. Contact us today for more information on this condition and how it can be treated.